preparation here we have providing new series of Practice Questions on Quantitative Aptitude – Section. Candidates those who are preparing for IBPS PO Mains 2018 Exams can practice these questions daily and make your preparation effective. Six persons P, Q, R, S, T and U are living on an eight storey building which has two vacant floors. The ground floor is numbered 1, the above one floor is numbered 2 and so on till the topmost floor is numbered 8. Each of them has different professions as Teacher, Scientist, Engineer, HR, Economist and Doctor but necessary in the same order. All of them are belongs to same family with three different generations. S lives on one of the odd numbered floors but not in the ground floor. Only two persons are living between the one who is Teacher and S, who is the only daughter of R. The vacant floors are not immediately above or below each other and none of the vacant floors are in topmost or bottom most floors. Only one floor between U’s son and the one who is an Economist.At least three persons living between the one who is an Engineer and the HR, who is the husband of S. The HR lives one of the floors above the Engineer. U and her son Q, who is the Doctor are living in adjacent floors to each other. Only one of the odd numbered floors is vacant floor. S is not an Economist. The Engineer is the mother of S. T is the father of the one who is an Economist. P lives immediately above the one who is a Scientist. P’s grandfather is neither HR nor an Engineer. Who among the following lives on the topmost floor? S lives on one of the odd numbered floors but not in the ground floor. 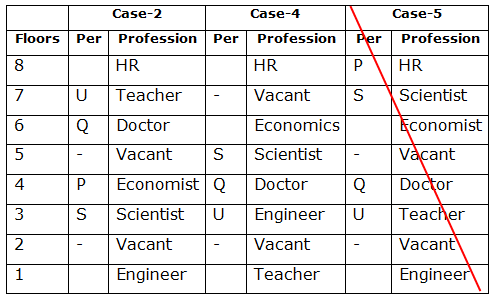 Only two persons are living between the one who is Teacher and S, who is the only daughter of R. The vacant floors are not immediately above or below each other and none of the vacant floors are in topmost or bottom most floors. Here, S is the only daughter of R.
Only one floor between U’s son and the one who is an Economist.At least three persons living between the one who is an Engineer and the HR, who is the husband of S.
The HR lives one of the floors above the Engineer. U and her son Q, who is the Doctor are living in adjacent floors to each other. Only one of the odd numbered floors is vacant floor. S is not an Economist. The Engineer is the mother of S. T is the father of the one who is an Economist. P lives immediately above the one who is a Scientist. So, Case-5 will be dropped. P’s grandfather is neither HR nor an Engineer. SO, Case-2 will be dropped. How is the HR related to the Teacher? 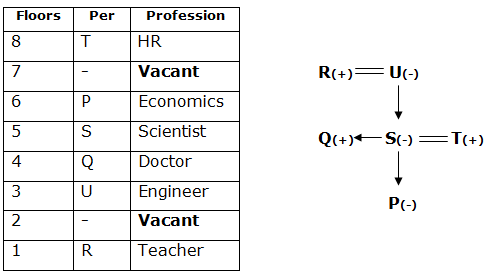 How many persons are living between R and the Scientist? Who among the following lives on the second floor? How many male members are there in the family? Statement I:Election Commission of India (ECI) has launched a campaign to increase the voting percentage in India among the youngsters through social media. Statement II:Government allows the social media in India to signs agreement and indent for the awareness programs. The government allows the social media to broadcast the awareness programs. So, the ECI use the social media to spread the awareness campaign. Statement I: Measuring customer satisfaction provides an indication of how successful the organization is at providing products and/or services to the marketplace. Statement II: Customer satisfaction is measured at the individual level, but it is almost always reported at an aggregate level. Both are effects of customer satisfaction. Statement: Banking and all other kind of financial services has made its presence in the digital space and it's growing every day. Statement II: Few banks and digital banking system has also come up with this but most bank charges for not maintaining minimum balance. Statement I implies that digital banking is growing every day, whereas statement II implies that there is no minimum balance required to maintain the account in bank. c) if either assumption I or II is implicit. d) if neither assumption I nor II is implicit. e) if both assumption I and II are implicit. Statement:Home Secretaryasked the officials to check spread of rumours and messages inciting unrest, cybercrimes and other activities that could be detrimental to national security. Assumption I:The protests in the country are increasing day by day against the government. Assumption II: Cybercrime is one of the biggest global challenge to tackle the online thefts. Both the assumptions are conveying the problems of the cybercrime and the rumours spreading in the country. Statement: The Finance Ministry released the restriction notification to the all Public and Private Sector Banks for the money filling in their ATMs by own or private agencies. Assumption I: Most of the banking thefts are done by the private ATM money filling agencies. Assumption II: It is very struggleto handle large amount of money by the bank or private agencies to fill in the ATMs. Either assumption I or assumption II implicit the statement. 1) Who among the following lives on the topmost floor? 2) How is the HR related to the Teacher? 3) How many persons are living between R and the Scientist? 4) Who among the following lives on the second floor? 5) How many male members are there in the family? 6) Statement I:Election Commission of India (ECI) has launched a campaign to increase the voting percentage in India among the youngsters through social media. 7) Statement I: Measuring customer satisfaction provides an indication of how successful the organization is at providing products and/or services to the marketplace. 8) Statement: Banking and all other kind of financial services has made its presence in the digital space and it’s growing every day. 9) Statement:Home Secretaryasked the officials to check spread of rumours and messages inciting unrest, cybercrimes and other activities that could be detrimental to national security. 10) Statement: The Finance Ministry released the restriction notification to the all Public and Private Sector Banks for the money filling in their ATMs by own or private agencies.